I didn't dislike this book altogether, it was just really hard for me to get beyond Bechdel's over-the-top self-absorption. It permeated the whole book in a way that felt like I was listening to a stranger complain about their problems for two hours, which is never fun. It really took away from the story as a whole. Let me explain: Are You My Mother? is very meta, which is to say the majority of the book concerns Bechdel's self; the story as a whole is very internal, recursive, and interior. We spend the majority of the novel inside Alison's head (Alison the character) as she attempts to piece together her identity, her faults, and her weaknesses in terms of the relationship she has with her mother. We go to Alison's therapy sessions, and more of Alison's therapy sessions, in which she discusses her mother, her childhood, her failed relationships, and her own psychoanalysis. These therapy sessions are never ending. Page after page, complaint and complaint; I'm all for the coming of age, story of self-awakening, but at times this book felt exhausting. Did I mention the therapy sessions? With that said, the book does offer a lot to digest. 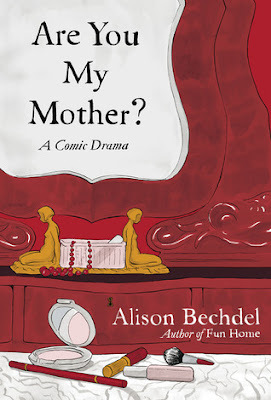 Much of the novel is preoccupied with the writings of child psychoanalysis Donald Winnicot, and Bechdel incorporates his ideas into her story in a way that feels relevant and even at times, interesting. There are many layers and endless metaphors that come together and keep it interesting. The relationship Alison has with her mother is one of the many strands of the book. 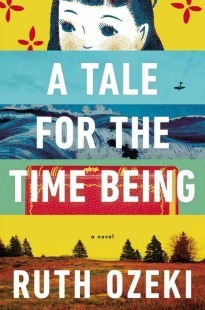 Virginia Woolf makes an appearance as a character, and Alison uses Woolf to make connections between her own dairy, memoir writing, and fiction writing. She also examines the idea of the transitional object; who has whom between a mother and a child? This is the second review of this that said "skip this one, go for Fun Home". Le sigh. Le sigh is right. But seriously, try FUN HOME! "it was just really hard for me to get beyond Bechdel's over-the-top self-absorption." YES, totally. And there's the problem of, if you don't really buy psychoanalysis, a lot of her "of course this is true" conclusions don't hold water. Ugh Fun Home is so good. I mean, I might re-read this later, just because I bought it and it doesn't take too much time to read. Plus she's still crazy-smart at least. She is crazy-smart, and I felt like it was translated in this book as well, it was just so exhausting! So sad this one missed the mark. Yeah, that totally sounds like something I'd really avoid. Too bad especially after you went to the reading and had such expectations. Such is life, I guess. Did you say it was a graphic? I think I thumbed through a copy at the bookstore. Bummer. I'll probably get it from the library. I like meta, but I loved Fun Home, so I'll probably be disappointed. Oh dear... I've got this on reserve at the library at the moment and I'm going to have to pay my 50p for it so I'll read it, but now I"m like... :(. I loved Fun Home so much! Damn. I've been bugging the office at work, asking if this book has come in yet. Bechdel could be self-absorbed, meta, anything she wants. I will still eat this book up as soon as it arrives. Thanks for the honest review. As much as I enjoyed Fun Home, I'll probably skip this one because I keep hearing the same thing about it. I don't mind meta, but as a psychology graduate I've had enough of psychoanalysis for the forseable future - think I'll give this one a miss!